Freaking hearts of palm. I think the time spent trying to purchase some I could have cooked through another cookbook. I contacted local exotic food stores, local wholesalers, suppliers abroad and couldn’t get hold of them. I even scoured the freezer section of tons of stores in the hope they would have frozen hearts of palm, but in my experience it is either fresh or canned. At one time I thought I hit gold with a vegetable supplier of restaurants saying he could get them, but when I got them they turned out to be sugar canes instead of hearts of palm. Canned. Blew. I hate I had to resort to the canned ones after failing to obtain the real, fresh deal. Fresh hearts of palm have never been on a plate before me, but I’m 100% sure the canned variety is very far removed from the former. The stalks are slim, already cooked and posses a generic canned taste. A bit like canned artichokes. The thing is I didn’t really have an option to wait longer with this recipe. I’ve already made most of the lamb dish and had this dish in the freezer (made components a while ago when I thought I could get fresh hearts of palm), so the Big Fat Duck Cookbook is almost done. There was no time to wait for March or April, the months fresh hearts of palm are in season according to an importer here in Amsterdam. To summarize an elaborate introduction: I used canned hearts of palm. 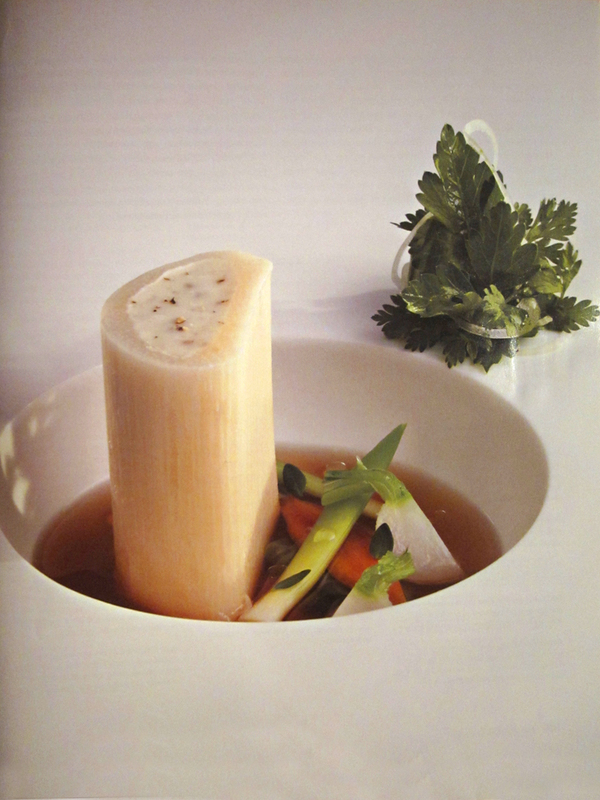 In times with the prospect of fresh hearts of palm at my disposal I started with the vegetable consommé. It is made a bit like the one from the Gold, frankincense & Myhhr dish: vegetables cooked in beurre noisette, everything pressure-cooked and clarified. Two things about the stock. It uses A LOT of vegetables. Five kilos in total or 2½kg if cut in half. My pressure cooker has nothing to be ashamed of size wise, but it took some higher mathematics to fit all the vegetables in. It has been a productive weekend. A number of ingredients of my ‘been looking for them for ages and can’t find the fuckers’ list could be crossed off and we made 2½ dishes on Saturday. ‘We’ are the couple of the Lasagne of Langoustine dish and I. The half in two and a half is the Vegetarian Pot Au Feu, which had to be called off due to a last minute cancellation of the fresh hearts of palm (we already made some components). What did get made are the recipes of the book requiring liquid nitrogen. We had a chance to use freaking liquid nitrogen at home (see this post how I got it)! 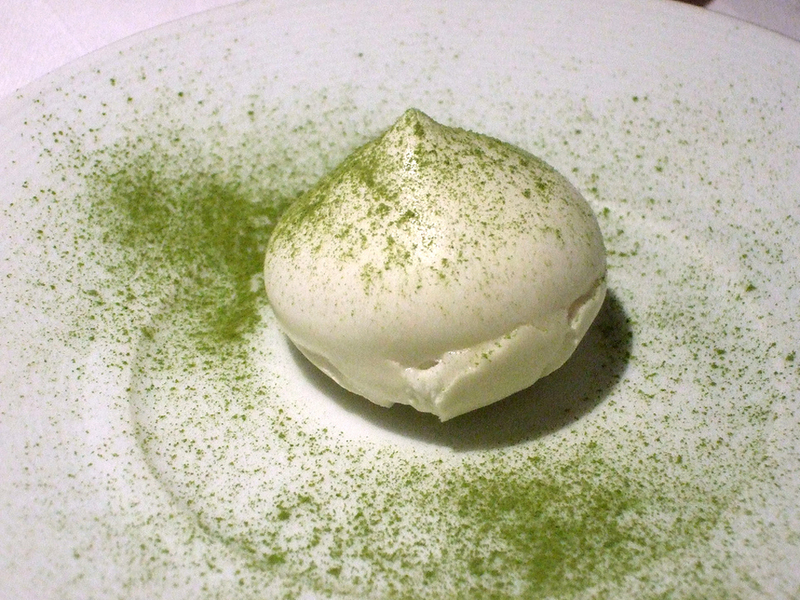 It was so much fun, but first the necessary steps to have some Fat Duck use for the nitrogen: making a lime mousse. 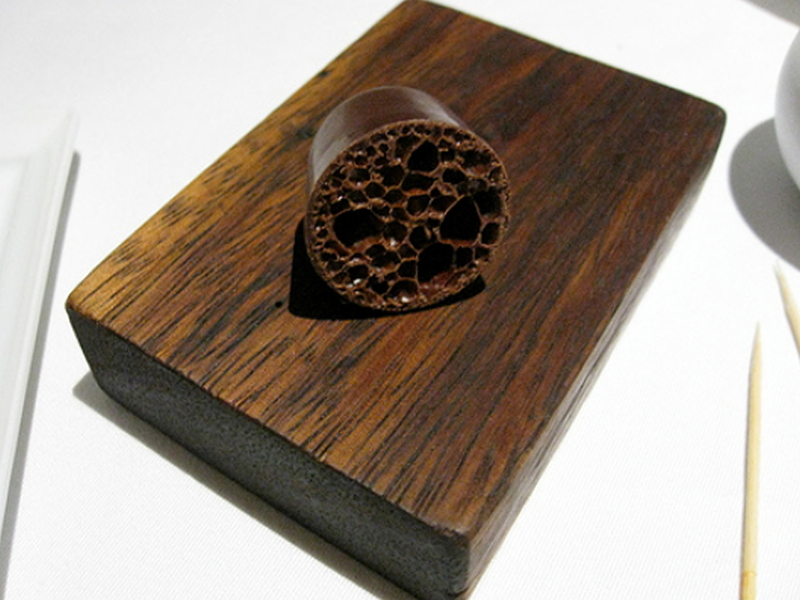 The mousse is served as a palate cleanser at The Fat Duck, giving a cold, sweet and sour sensation. It’s made by mixing a pectin base with matcha tea powder, malic acid, vodka, egg white and pasteurized lime juice. When I first read the recipe some time ago I always wondered why you would have to use pasteurized lime juice. By coincidence I read a post on the blog of Dave Arnold and Nils Norén on clarifying lime juice and their comments on freshly squeezed lime juice. Apparently lime juice does not keep well, deteriorating pretty rapidly, whether you boil, refrigerate or freeze it. The pasteurization probably has something to do with this characteristic of lime juice. A note on the pectin. You have to use high methoxyl confectioner’s pectin. I had no idea what these words meant and started to read articles on pectin. In this article it’s explained that pectin could, in general, be divided in a low methoxyl and high methoxyl camp. The former reacts with calcium and the latter with sugar and acid. I’ve been using a slow-set yellow pectin, which gels at a certain sugar and acid level, so I figured it would be suited for this recipe. The word ‘confectioner’s still bugs me a bit, have we used the right pectin?, but the mousse turned out fine, so I guess we did. I’ve read about the use of rose petals, but never used them. It was time for a change. My local flower shop had some (obvious) and an exchange later I took three home. The lighter one on the foreground was an extra from the lovely girl at the shop. In Search of Short Ribs. That could be the title of the past week. I went from store, to butcher to the internet and could not procure some ribs. It didn’t help I was clueless what the translation of short ribs is in Dutch, so with every visit to the butcher I hoped they would be familiar with the words ribs and short. After some time I realized I knew the ultimate source in everything meat related, my uncle, who owned a highly regarded butcher shop (now retired). I called him and made it to ‘short ri…’ before he fired away on short ribs: what cut of meat it is (the ‘klaprib’ in Dutch for those interested) and which part of the animal it comes from. 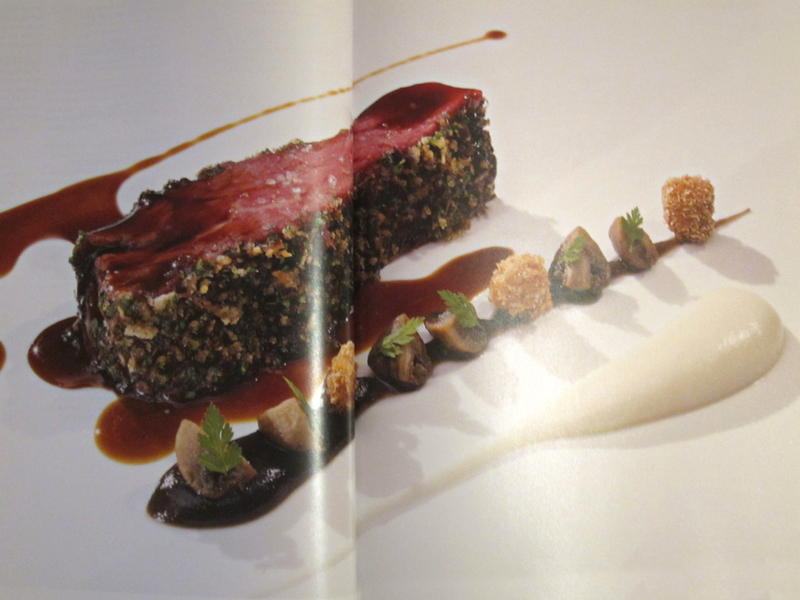 From what I gathered it is the meat (with bone) that extends from the Rib Roast to the breast of a cow, so it extends from the Côte de Boeuf of the third course of Beef Royal. My uncle even recommended a butcher shop, with their own livestock, where I could probably get the ribs. He was right. Butcher nowadays often order only parts of an animal and have therefore less control than butchers who butcher entire animals. An example is one of the top butcher shops in Amsterdam, who could only get me boned short ribs, not with ribs on the bone. With the short ribs sorted I wanted a short recipe to fill the gap between the courses and decided on the cornets. As always looks can be deceiving. A short recipe. A nightmare to produce (close to) Fat Duck results. Fragile pastry, small cornets and tiny dots of icing, it all adds up to possible failure. 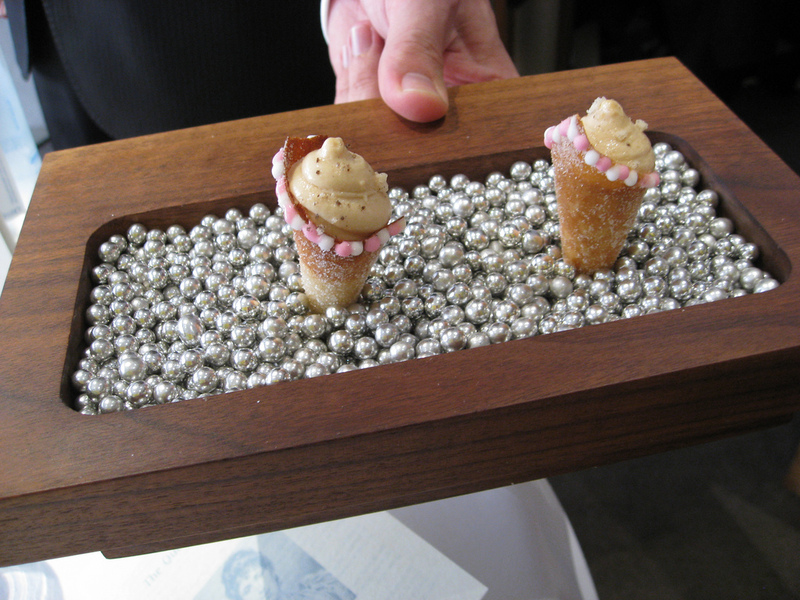 I needed to make a good couple of cornets before I was happy with them. 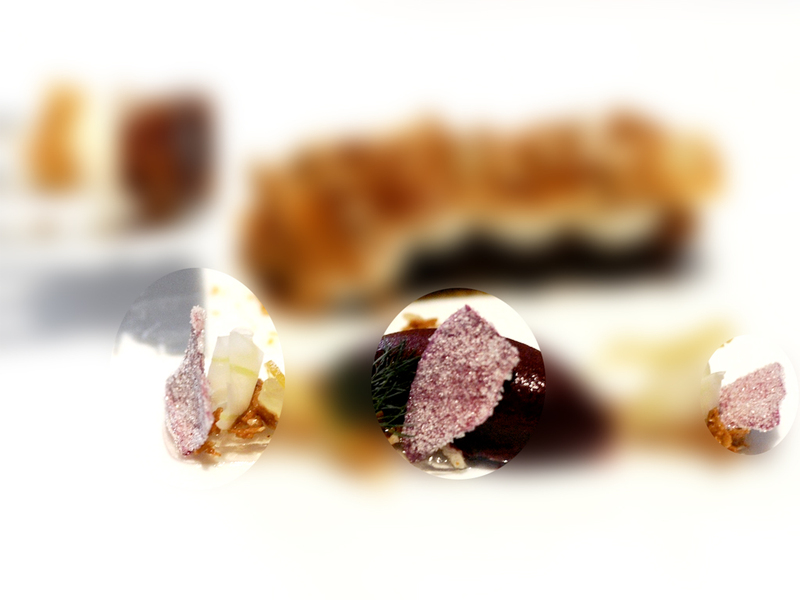 But lets start with more straightforward components of the dish. 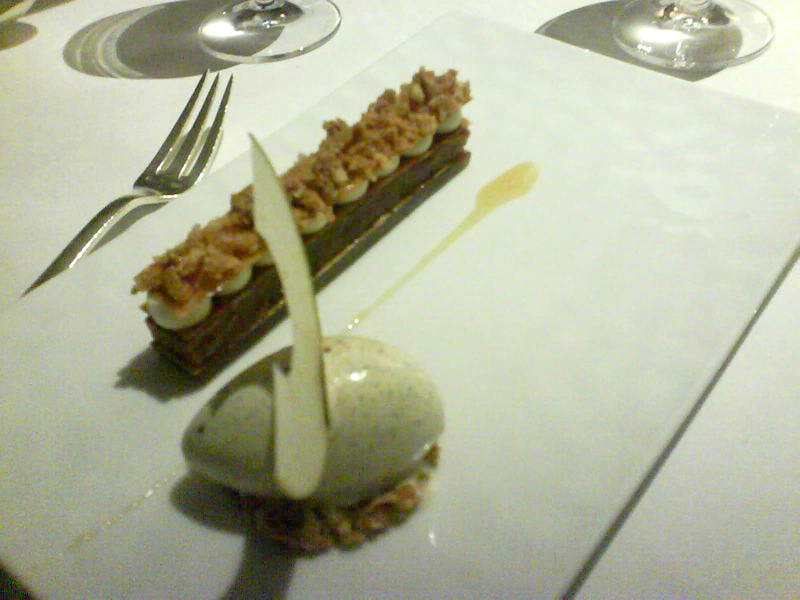 The filling is an apple ice cream and a ginger granite. 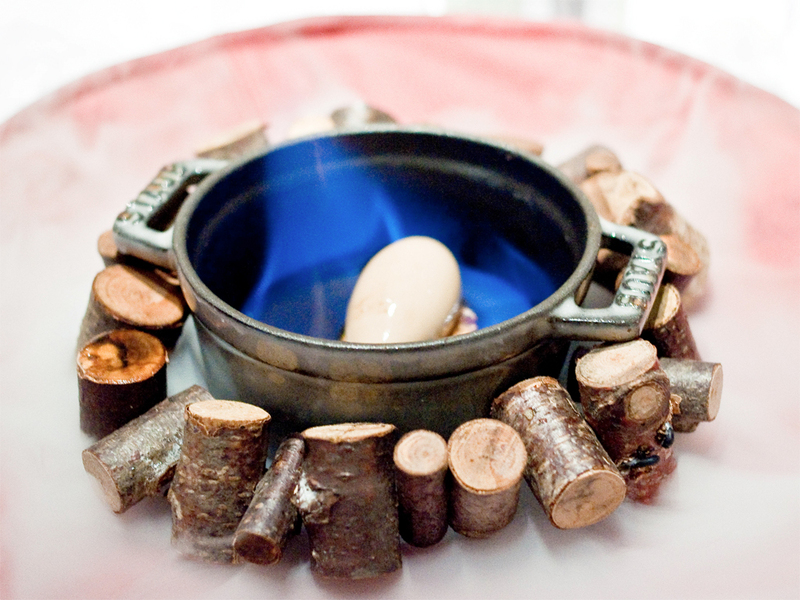 The ice cream is made from baked apples, lemons, full milk and typical ice cream ingredients. I did almost everything in a thermomix. It is very handy for pasteurizing an ice cream mix. A quick and easy recipe. A quick and easy post. Here it goes. 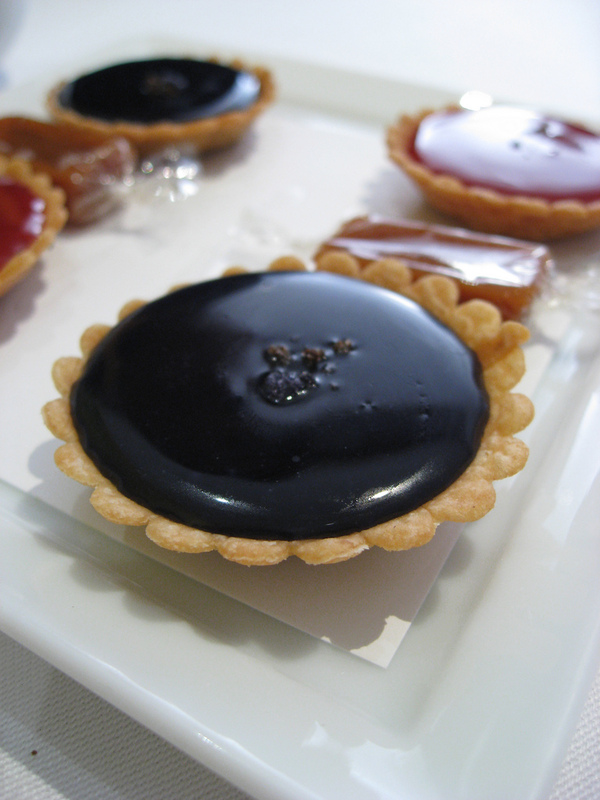 The filling of the tartlet is a violet caramel made from crystallized violet petals. You can get them at MSK Food Ingredients or, as I read online, in specialty stores, although I could only find them online.